It is estimated that in America, 72% of women and 42% of men will experience varicose veins by the time they are in their 60's. Varicose veins are superficial veins that have expanded in response to increased pressure caused by incompetent or absent valves. This dilation eventually prevents the valve cusps from closing properly resulting in reflux. Alternatively, a lack of competent valves can also cause dilation of the vein. 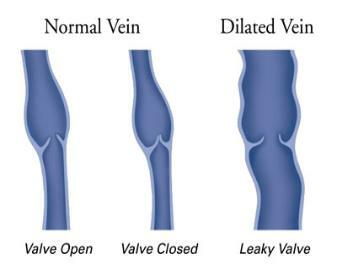 As one valve fails, increasing pressure is exerted on each more distal valve until they, too, become incompetent.Varicose veins can become inflamed and painful, and may form ulcers as well. They can be treated by destroying the main incompetent vein, followed by sclerosing or surgically removing the individual varicose veins.